During root canal therapy, an emergency dentist gently cleans out the damaged area and removes the tooth’s nerve. Then, they fill in the tooth with a special biocompatible material. Often, it’s necessary to place a crown after the procedure in order to protect the tooth from further damage. Although root canal therapy has a bad reputation, it’s really nothing to be afraid of! Thanks to anesthesia and sedation, patients are usually very comfortable throughout the procedure. 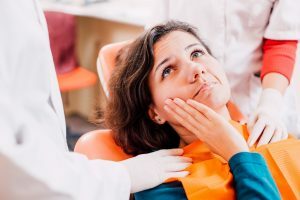 A bit of soreness and swelling is normal following root canal therapy, but such issues usually dissipate within a few days. Is Extraction a Viable Alternative to Root Canal Therapy? An empty space in your mouth can lead to a misaligned bite. When you lose a tooth, the bone that once supported it begins to deteriorate. Even a single missing tooth can make it inconvenient to eat all of your favorite foods. In some cases, a tooth is so badly damaged that there is no choice but to extract it. If that happens to you, you should begin to consider tooth replacement options right away. A dental bridge is a reliable way to fill in the gap, but dental implants are an even better option. An implant is a small titanium cylinder that serves as a substitute for a tooth’s root; a custom-made crown goes on top of it. This type of tooth replacement is the strongest, longest-lasting way to recomplete your smile. If you ever believe you may need root canal therapy, visit your dentist right away! Hopefully, they will be able to save your tooth and get you on the road to recovery in no time at all. Dr. Joanne Bancroft is an experienced dentist who handles each case with genuine compassion. She offers emergency services, dental implant restorations, and a wide range of other services that aim to help her patients enjoy healthy, pain-free smiles. To learn more about her and the treatments she can provide, contact our office at 720-458-6561.